These are the results for all Argentina? I'm suprised because on some websites it's claimed they're 70 to 97% European. Even Argentinians themselves often tell you how proud are of their Italian, Spanish and Basque ancestors, yet the results show they're mostly Amerindian! "Argentineans carried a large fraction of European genetic heritage in their Y-chromosomal (94.1%) and autosomal (78.5%) DNA, but their mitochondrial gene pool is mostly of Native American ancestry (53.7%); instead, African heritage was small in all three genetic systems (<4%)." We did know that the European contribution to the Latin American Gene pool is overwhelming by the male side (till 90%), but by the maternal side it is divided on average in three part almost at the same level: Native American, European, African. Argentine has probably more European mitochondria than other South American countries. But the data are interesting for me by another side. Even though the coding region hasn’t been tested, we have 6 K1a1b1a, and even though Argentine has always had an huge Jewish community, there is an haplotype, sample 2379 from Cordova, with the mutations at 146 and 150 in HVRII, not ever detected in the Jews tested. This can only mean that there are European K1a1b1a-s of not Jewish descent. Given the overwhelming contribution Italians gave (with Spaniards) to the gene pool of this country, perhaps this is the second Italian K1a1b1a I was looking for. Neanderthalerin: it refers to mtDNA only. Because of successive, persistent, immigration waves of mostly men across the Ocean, the total percentage of Native American blood is, no doubt, much lower than would be apparent by mtDNA alone (the exact figure can only be determined by autosomal DNA studies). I'm not so surprised. You think for example Che Guevara, a bourgeois by family, whose Basque and Irish ancestry are well known and yet he looks somewhat Native American. And when you look at his mother (second from left in this pic) you understand where it comes from: the Native American origin may have been hidden or ignored but it is obviously there. The NA traits are still visible in his sisters as well. Che's mother in any case does not look purebred Irish and Che himself surely had Native American mtDNA, judging by all this. And I'm mentioning Che because of his bourgeois family. But this is probably more common in working class people, like Maradona and such. ""Argentineans carried a large fraction of European genetic heritage in their Y-chromosomal (94.1%) and autosomal (78.5%) DNA, but their mitochondrial gene pool is mostly of Native American ancestry (53.7%); instead, African heritage was small in all three genetic systems (<4%)."" "And I'm mentioning Che because of his bourgeois family. But this is probably more common in working class people, like Maradona and such." Very likely. Most of the Argentinians I've met look pretty much like southern Europeans. Only a minority of them have perceptible N.A. admixture. It is not surprising for me to see this, because usually we take into consideration the urban areas of Argentina, but if you also consider the rural areas, especially in the extreme provinces , clearly the indigenous element increases. As with other areas of new settlement such as Canada, Australia and the United States, Argentina is considered a country of immigrants. Most Argentines are descended from colonial-era settlers and of the 19th and 20th century immigrants from Europe, and 86.4% of Argentina’s population self-identify as European descent, -Census Whole Argentina in October 2010-. An estimated 8% of the population is mestizo, and a further 4% of Argentines were of Arab or East Asian heritage. In the last national census, based on self-identification, 600,000 Argentines (1.6%) declared to be Amerindians the same for the 2010 census as well as 2001 census (see Demographics of Argentina for genetic studies on the matter). Following the arrival of the initial Spanish colonists, over 6.2 million Europeans immigrated to Argentina from the mid-19th to mid-20th centuries Argentina was second only to the United States in the number of European immigrants received- but Argentina first in proportion to the living population there- , and at the time, the national population doubled every two decades mostly as a result. It was not until the creation of the Viceroyalty of Río de la Plata in 1776, that the first censuses with classification into castas were conducted. The 1778 Census ordered by viceroy Juan José de Vértiz in Buenos Aires revealed that, of a total population of 37,130 inhabitants, the Spaniards and Criollos numbered 25,451, or 68.55% of the total. Another census carried out in the Corregimiento deCuyo –Mendoza- in 1777 showed that the Spaniards and Criollos numbered 4,491 (or 51.24%) out of a population of 8,765 inhabitants. In Córdoba(city and countryside) the Spanish/Criollo people comprised a 39.36% (about 14,170) of 36,000 inhabitants. All Argentina had anly 700.000 dwellers at 1810 when the Nation births. The first Unitarian Argentina president -before the Federal Nation that birth in 1853-, Bernardino Rivadavia, established the Immigration Commission in 1824. Volume 74, Issue 1, January 2010, Pages: 65–76, Daniel Corach et al. We could say if that European ancestry is in mtDNA (44.3%) and Y-chromosome (94.1%) gives an estimate of 69.2% -incorrect-, compared to 78.6% for autosomal markers obtained in the same samples. Native S. American in mtDNA (53.7%) and Y-chromosome (4.9%) gives an estimate of 29.3% -incorrect-, compared to 17.28% for autosomal markers from the samples. Finally, African mtDNA (2%) and Y-chromosomes (0.9%) gives an estimate of 1.45% diluting by melting. 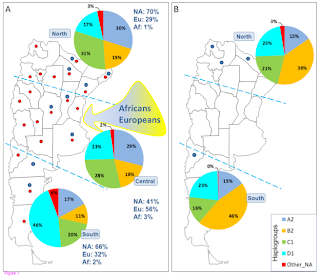 Others articles indicated between 80 to 85 % of European ancestry and 10 to 15% of Amerindian ancestry in the whole chromosome pool population and only 0.9 to 1.7% of African ancestry markers, by autosomal markers. But by Y DNA markers the studies varies from 94.1 to 97.6 - UNS – Argentina. We explained these concepts because the first colonists or conquerors were males only that mated with indigenous women and later with mestizo women and so. When the Great European migration began in 1850 the first were men lonely principally following the same process and later the whole families or males and females, come from Europe also Central and East Europe but more from Italy and South Europe. The surname is in whole Argentina are 52% of Italy origin, 33% of Spanish or Portuguese origin, 8% of French and Basque origin, 4, 5% of Central or East Europe – including Jews-, 1.5% of Lebanese or Arab origin and only 1% of Amerindian origin, also we are more than 92% urban population, with 70% living in pampas and central Argentina. All of these show a bias between males and females in Argentina. In schools we learned that we are more than 90% Europeans and these genetics studies striking us the last 20 until 7 years ago but not now. Noelia – physician UBA- Argentina.